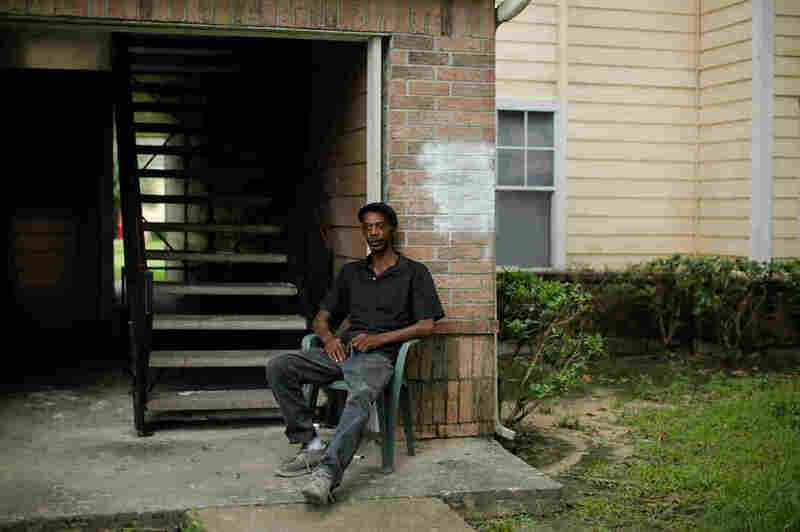 In Houston, Floods Push Impoverished Residents Into Crisis : The Two-Way Poor neighborhoods on the northeast side were hit hard by the storm. But residents say they received little help evacuating, and now they are struggling to get basics: food, water and information. 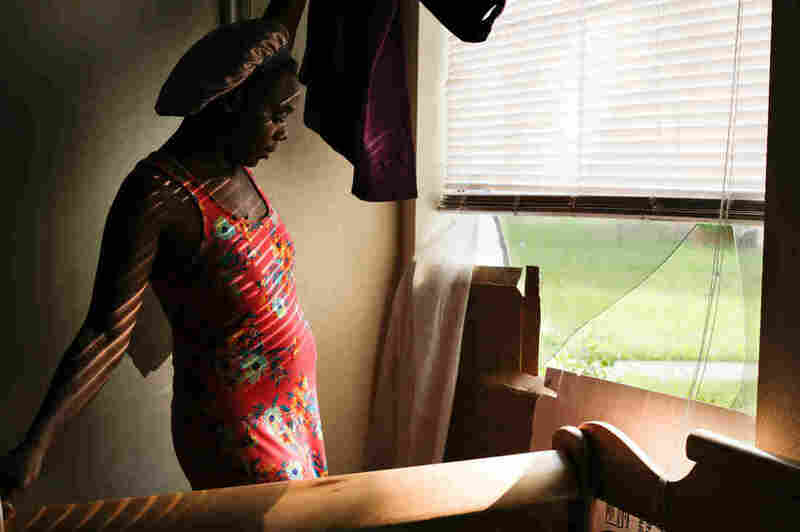 Whitlee Hurd, the mother of five children, walks through her damaged home in northeast Houston. "This is my child's room but I can't have them sleep here now because the window is open," she says. "We told the maintenance man but he won't help us." Even as some shelters elsewhere in the city turn away extra volunteers and try to handle a massive influx of donations, many people in the northeast part of the city feel cut off from rescue and relief services. For a lot of families, the flood damage and lost wages are the difference between getting by and wondering how they'll make ends meet. Whitlee Hurd and Reartta Carson waited with seven children for rescue workers for three days in their first-floor apartments. Debris in the floodwater broke a window in one of the kids' bedrooms. The air conditioning unit outside flooded and hasn't turned on since Sunday. "My son has asthma," Carson says. "There's no air. No food." "All we have is chips and candy, and we're running out of that," says Hurd. Their street, Tidwell Road, was impassable until Wednesday. The neighborhood is bordered by two bayous — Green's Bayou to the east and Hall's Bayou to the north — both of which crested well above flood stage according to the National Weather Service. Carson says National Guard trucks came through twice between Sunday and Wednesday, but Guard members said they couldn't help the family. They were in rescue mode. "I told them, you don't need to evacuate us, but we need food and fans," says Hurd. "They said we can't help; we'll come back. Come back? What? They didn't never come back." "Food and fans, food and fans," she says, shaking her head. "I just keep saying it, we need food and fans." Carson walked to the closest grocery store, about a mile down the road, on Tuesday, when the street was still flooded, but found it closed because people had stolen food. She says the owners of the store yelled at her, "Don't walk over here! Everything broken into!" "First of all, baby, I don't want to rob nothing," she says. "My child needs to eat! I got kids at home that's hungry. Y'all not sending anyone over here to help us, so all we can do is walk through this water to try to find something." With no other option, Hurd drove 30 minutes to a grocery store in a neighborhood closer to downtown Houston on Wednesday and stood in line for an hour to buy food there. "They were sending [help] to the ones that were not our color, know what I'm saying?" Hurd says. "If you had money, you [got boats arriving with] help. The less fortunate ones, we had to walk. Where's our help? We're not asking to be evacuated, we're just asking for food and fans." City officials say the emergency system was overwhelmed by the volume of calls during the storm and that the response has been citywide. At its height, "it was a lake. You didn't know where that bayou was because you couldn't tell. It all was a lake," she says. Dunn, 72, evacuated her home in ankle-deep water on Saturday. "When your mattress start floating, it's time to get out," she says. 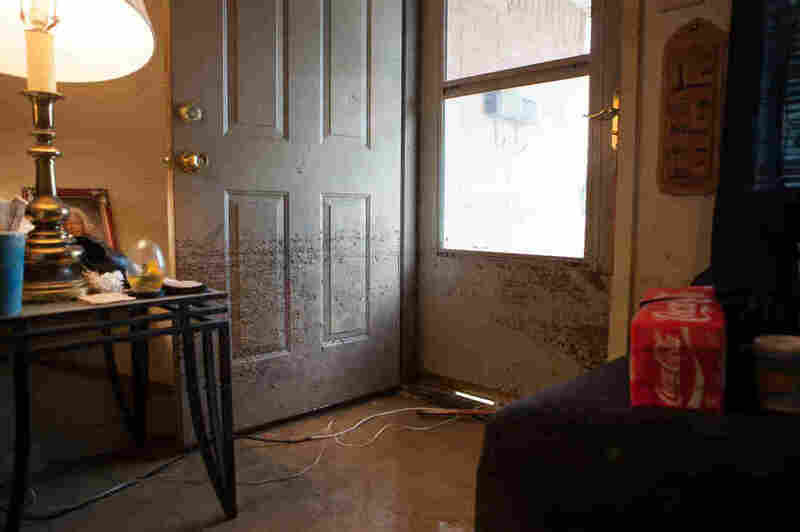 The floodwaters had entered her home, soaking the couch up to the seat cushions. Her car was pushed by the force of the water to an angle in her driveway. Grass and mud are drying under the door handles. 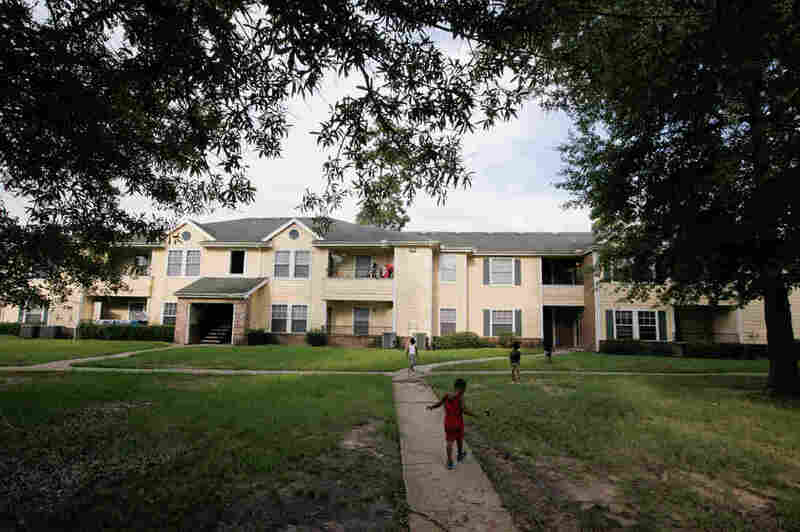 Jim Harris, the manager of her apartment complex, was checking on the complex's 49 units. He told Dunn and her family not to clean anything up. "No, no, no," he says. "Just leave it as it is until FEMA comes. I know that you're trying to get back to your life, but FEMA says don't touch anything until they can actually come and see it." Dunn has flood insurance, which sets her apart from most Houstonians. But she says the insurance won't cover all the repairs, so she is going to need help from FEMA too. 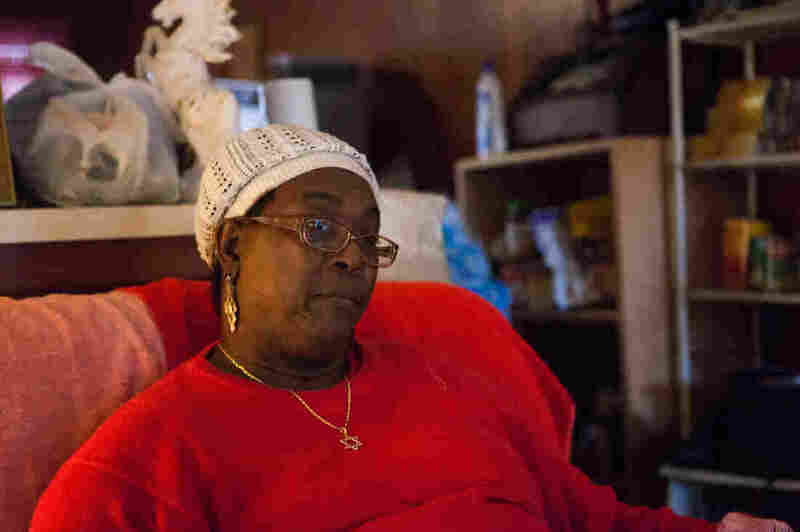 She and her neighbors will be relying on emergency funds and interim housing. None of them can afford to stay in a hotel long-term, and after staying in shelters, they have no interest in going back. 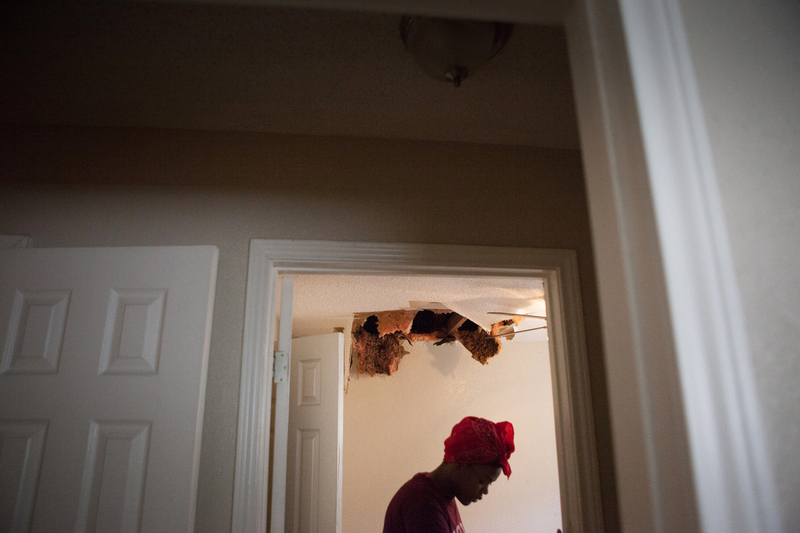 Teniya Brewer walks through Pauline Simpson's home looking at the water damage.